The point of this talk is to communicate some experiences related to the use of graphics to represent music analysis. I’ll start with some thoughts on how we listen to music, and then ‘ll focus on music analysis as an auditive experience. The audition of music is an aesthetic-audio-temporary experience. The sound reaches the ears -the whole body- of the listener while the temporary articulations of sounds and silences produces an effect on his psyche. The articulation of sounds in time- the musical discourse- attracts the listener’s attention through the setting of musical ideas and their elaborations: surprising situations, moments of expectation, the tranquillizing appearence of something already heard or the certainty that the end of the discourse is near. - the listener’s comprehension of the formal structure of the work. Each element of the discourse has a place in the construction of the form. The articulation between these elements - simultaneous and succesive - imagined by the composer and set forth by the performer, creates stimuli that, processed by the memory, help the listener to generate the musical image. - understand the mechanisms of perception and memory. - observing the moment when the exposition of each phenomenon ends. At this moment these phenomena are comprehended. The audition has to do with a mental process that comes and goes in time, scanning new data and building up comprehensively what has already been heard. 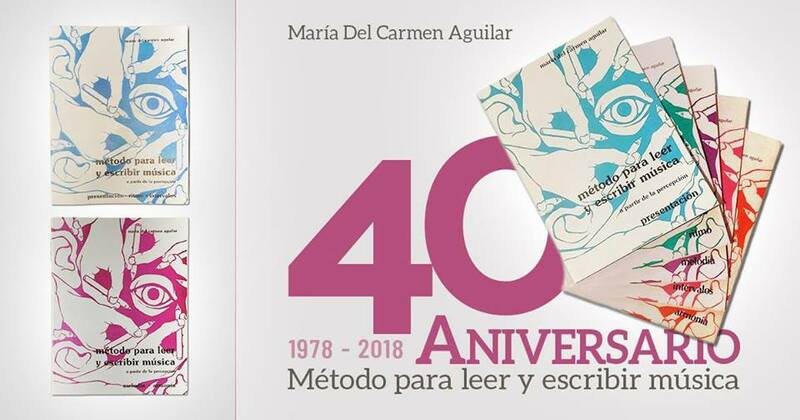 Due to the fact that our perception is inclined to simplify its tasks by means of simmetry and simple relations, the acnowlegdment of each segment of the discourse leads us tu expet som kind of continuity to satisfy these tendencies. The attention of the listener is then focused simultaneoulsy on the perception of the present moment, rebuilding what has already happened and foreseeing what is to come. This process is hard and giddy, and requires a stronger effort when the music becomes more complex. memory, which is the ability to recognize, remember and integrate data and, at the same time, make a self-observation of one's own expectations, verying whether they have been satisfied of frustrated. This training of the comprehensive memory is essential for the musician. In the first place, all of them are music listeners. So, the develoment of this kind of comprehention will help them in each area of expertise. The performer shall refine his intuition and will find better interpretative responses. The composer will have better sources from which to develop his language. The teacher will have a deeper understanding of his student's learning processes. The training of the comprehensive memory can be made through musical analysis. The analysis begins with the aesthetic joy which the contact with the work produces. Next comes the wish to investigate the nature of the work and to understand its details; thus, a richer synthesis is achieved. The possibility given by recordings of repeating the audition as many time as neccesary, is of great help for this kind of work. 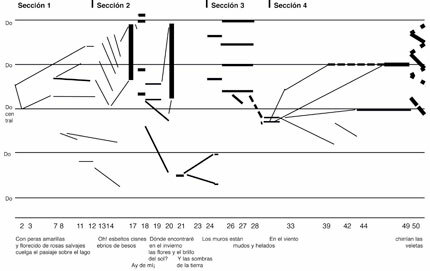 Repeated auditions produce a contraction of the time (condensation of memory) that clarify what was diffuse in memory, thus opening the way for a clearer picture in order to understand what is essential in the musical message. - concentrate on the details, integrating them into the whole work. It is important to keep in mind that all analys through listening observes the composer's work through the interpreter's version. A good interpreter can illuminate and point out some elements that we wouldn't recognize at a superficial glance. A bad version instead can hide data which are essential for the comprehension of the work. The analysis should try to identify these data and filter them through interpretation. When we make an auditive analysis we use the perceptive processes above described. This is why we need some kind of visual support, in order to fix the temporary flow in space. Graphic representations can be useful for this task. The use of the score is a step, but not an essential one. It gives a spacial frame that allows a check-up while listening, allowing students to mark or point out important elements. A score is a familiar and tranquillizing object to the musician. In spite of this, in many cases it shows a distorted and incomplete representation of the music. A good reader, having a good inner representation of the written music can overcome this problem, but frequently under the suggestion of scores, one can be mislead into believing that one hears accents, textures, etc. that are not really there. - as a final product of a reflective step. That is how a feedback relationship between concentrated audition and graphic synthesis is produced. Such graphics can recreate the first aesthetic experience, now enriched by the reflective step. The graphic representation is the transference of certain data extracted from the whole work to a code of representation arbitrarily chosen. The choice of the graphic code requires a clear comprehension of the nature of the data to be represented. The best code will be the one which most synthetically allows us to represent a more meaningful amount of relevant data. Once a graphic code is chosen, it is neccesary to consider the musical data from the point of view of the posssibility of representation. This evaluation requires a subtlety in the perception of data because it is neccesary to take decisions about the colours, sizes and fonts to be used. So, the student must think of the music that was heard and perhaps, listen to it thoroughly once again, or even many times if neccesary. Once data is represented ine graphic, it must be checked out by hearing it again. Sometimes a change is needed in the representation- or in the whole code in case it proves to be inadequate. The interactive relationship between audition, reflection and graphic representation is highly productive. The perception of the details becomes more subtle, the observation of the relationship between elements is deepened and the contradictions and ambiguities that appear in these relationships are noted. The bi-dimensional nature of the graphic representations has certain limitations: in some cases it is impossible to concentrate all the elements in a single graphic. Then, it is fundamental to clearly determine if some elements should be attached to our scheme in parallel graphics. The simultaneous sight of these graphics will allow us to understand how aspects are organized and then combined. They can be either complementary or contradictory in order to build the form of the work. 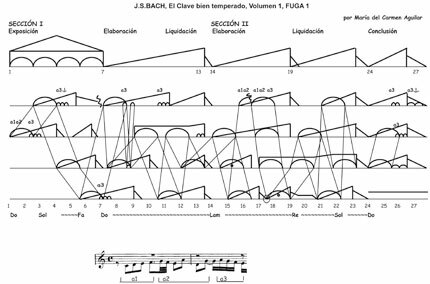 The observation of the graphics produces the final synthesis that reproduces the initial impact, felt at the first spontaneous audition of the music. - analysis courses for Art students not specializing in music. In all the cases the point was that students should propose their own graphics, showing studied parameters. Some representative codes were proposed, that had formerly proved to be useful, leaving the rest for free creation of codes. Though students had no visual art training, they generated very interesting graphics, which improved suggested techniques. Graphic codes contain some temporary reference: measures, time in seconds or proportional lenght of segments. Above the time reference line, the articulation of the discourse and the parts of the form are described. 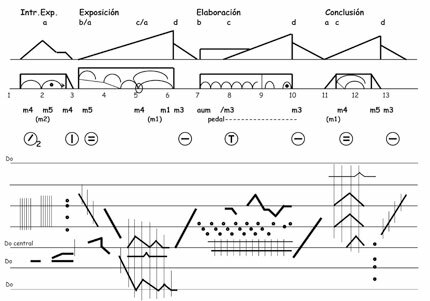 There are graphics thar are related to the organization of discourse: articulation of rhythmic cells, introduction and elaborations of themes, harmonic processes, etc. Other graphics show different types of syntactic construction: sequential structures, antecedent-consequent organizations, evolutive structures, deviations of symmetric expectations, etc. - the development of textures and timbres.